It’s time to start thinking about the top homemade gift ideas for the holidays. Making your own unique homemade gifts is a great way to save money and give special items to your friends and family. This list will give you the best choices for homemade gift ideas that you will love making and they will love receiving. Crocheted or Knitted Items. Scarves, mittens, hats and even shawls are all amazing choices for gifting to people. Grab some yarn and spend a few hours a week creating homemade crocheted or knitted items. 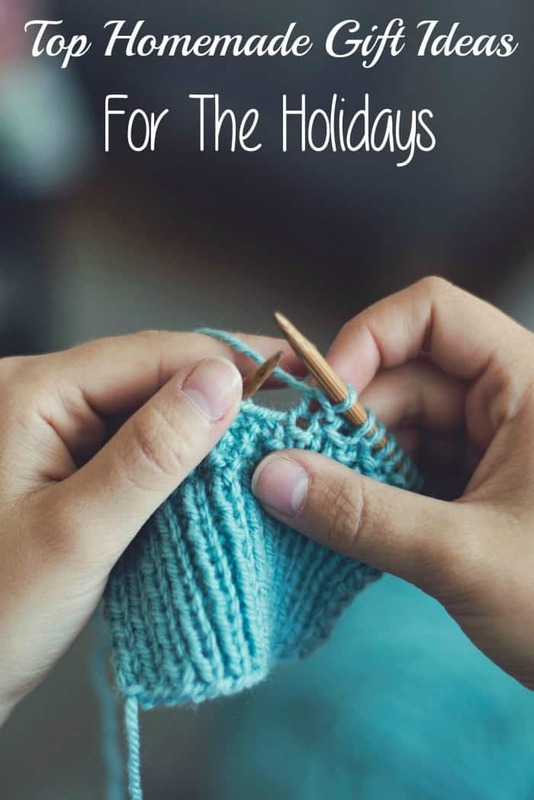 To make this homemade gift idea affordable, watch for great coupons and deals at places like Michael’s, Joann’s and other online retailers that have great deals on yarn. Homemade bath and body products. A handful of products and some great essential oils will give you the chance to make homemade bath and body products. The bulk of these are made with coconut oil, sugar, Shea butter and essential oils. They can be uniquely scented for the individual receiver. They are easy, inexpensive when made in batches and loved by everyone. Homemade foods. This is by far the most common in our list of top homemade gift ideas for the holidays. Candies, fudge, cookies, cakes, pies and various food related gifts are great choices that everyone loves. They are perfect for making allergy friendly, as well as customizing to the receivers favorite flavors. Kids can help get involved by measuring, rolling out doughs or even helping decorate gift tins. Gifts in a jar. There are tons of variations on the gifts in a jar trend, but food mixes are most popular. Things like the dry mix for brownies, cookies, cakes or even spiced tea and cocoa are great choices. Other gifts in jars include printing a fun label and stuffing a mason jar full of candy. Items like manicure sets with a few nail polishes, a set of Lego’s and mini figures or even handy pocket sized tools can all go into a jar with a cute label to gift to anyone on your list. Upcycled or DIY crafts and home décor. There are many people who are great at making crafts. Wreaths, upcycled vintage pieces, decorator frames with special quotes or pictures and more can easily be thrown together. If you are great with crafts, photography or scrapbooks this is an excellent way to go to create a fun homemade gift everyone will love receiving. Homemade coupon books. This has long been a popular choice for kids to make parents, or spouses to make each other. A simple printed or hand written set of coupons is a great way to give each other those little things that help out from day to day. Things like their choice of dinner, a day with no chores, a massage or foot rub can all be great choices. These top homemade gift ideas are perfect for the holidays, but can easily be adapted to any gifting need. From birthdays to anniversaries, these gifts are great, frugal and easy for anyone to manage. By Jennifer on November 16, 2015 Crafts, Frugal Living, Information, On The Cheap, Popular Posts, Trending Topics.